Away from the shops today at an icy Fota - see n-ice set of pics at http://corkandabout.blogspot.com Happy Christmas!! From Ronnie Moore’s 2009 Calendar. Many of you will be familiar with Gubbeen cheese products. But how about the sausages from their smokehouse? Bought a couple of packs from their stall in the Mahon Point Farmer’s Market today and tried out the ones with Sun Dried Tomato, Basil and Garlic. Absolutely lovely. Great texture, great flavour, all preceded by a lovely smell while cooking. Looking forward to the second pack - tomorrow! Been a regular visitor to the Mahon Point Farmers Market but it continues to surprise. It was very frosty today, the start of a 3 day market stint up to Christmas Eve. Some of the Thursday regulars were missing. Ballycotton Fish were there with some fine fresh fish. Moved on then to the nearby cheese stall and settled on the cheddar by Hegarty’s of Whitechurch. Picked up some gorgeous smoked sausages from Gubbeen Smokehouse and some chilli products (in jelly form) from Rebel Chilli before finishing with some inviting veg from the Burns Farm stall. Pleasantly surprised when picking up an order this week from Bubble Brothers store in Centre Park Road as the budget reduction of 60 cent per bottle had been applied. Sixty cent may not seem that great but when it is applied to a couple of cases, it can make quite a difference. Well done to Bubble and indeed to the other wine sellers who have rapidly applied the tax cut. I also noticed it in my pint at the Cotton Ball (did you see their Christmas lights?) last night. Bubble Brothers, as you may know, have quite a selection at Centre Park Road. They have a lot less room at the English Market but they make the best of it. I suppose the rule would be: the Market for a bottle or two, Centre Park Road (easy parking) for a case or two. In any event, the same high standards of service and courtesy apply. I’m looking forward to the Xanadu Margaret River Cabernet Sauvignon, one of the cases I picked up this week. Came across it at the Good Wine Show and thought it was a winner. Tomato Broth, served with a Gin Cream (Woodside). A: That Brittany Ferries would open a land version (in Ringaksiddy or thereabouts) of Le Flora, the restaurant on board their Cork-Roscof ferry Pont Aven. B: That Le Cottage and La Foret be beamed across from the north banks of the Gironde estuary to the North Bank of the Lee (preferably above flood levels!). C: Fishy Fishy to open to city. Made an overdue visit to Ying’s Palace Chinese Restaurant last night and found it even better value than previously and that without any drop at all in quality. I usually go for one of the set meals. They have one at less than 16 euro and three between twenty and twenty three euro. We (these set meals are for two minimum) started with the prawn crackers and then had the soup, followed by shredded duck with little pancakes, salad and sauce. Main course consisted of two sizzling dishes: beef on one, king prawns on the other, both gorgeous. With these menus, you get a free glass of wine each and house wines start at €4.90 a glass. Coffee was included in the price and they also surprised us with some beautifully cut fresh fruit as a dessert (not on the menu). And another surprise on the way out when we presented with a Chinese calendar on a scroll. Nice restaurant and nice people. The takeaway does very well indeed but is a shame that more don't take advantage of this excellent restaurant where the prices are very reasonable indeed. Costa Coffee shops are springing up around Cork city but my first visit to one came in Killarney yesterday when we called to their place in the local Outlet Centre. Comfortable seats, plus a recommendation from our local “guide” beckoned us in and I enjoyed my cup of Americano. Took a medium but it was actually quite large . It cost €2.90 and tasted very well indeed. There is no table service here. You go to the counter and pick up your coffee and scone or whatever. If you’re not into coffee they serve a wide range of alternatives including hot chocolate, teas and infusions, iced coffees and frescato. Julian Graves is one of the outlets operating in the Killarney Outlet centre. Quite a choice here of nuts, seeds, sweets, fruits and so on. “A bit of what you fancy” as they say themselves. Quite a choice but are you really getting a discount here? Take their Liquorice All Sorts. Regular cost in the UK is £3.99 (£2.99 on the website). In Killarney it is €4.59. Yesterday, there was a 20 per cent discount which brought it down to €3.59. Discount or not, I was tempted and bought a 750g bag. Got some really large flat mushrooms at the Tipperary Mushrooms stall in Mahon Point recently. They have various dressings available. I got chorizo and mozzarella. They make a decent starter but don't expect too much of the dressings. The cheese was a very very thin slice and the sausage bits were minute. Still the taste was there and they went down well. About 30 of us descended on Mike Sheahan’s Killumney Inn last night for a works re-union. The efficient barman kept the drinks flowing and our host came up trumps with baskets of decent finger-food including some very nice chicken pieces which went down well with my stout. The Killumney Inn, a long established bar and restaurant complex just off the main Cork-Macroom road (near EMC), is a popular venue and can be very busy for weekend lunches. Mr Sheahan, a hands on host, was in fine form. He sponsors the local soccer team, Killumney Utd, and reckons they could come up trumps this season. First came across Frank Hederman’s smoked fish when I bought some eel from his stall at the Farmers’ Market in Midleton a couple of years back. They still do the Farmers’ Markets ay Cobh and Midleton and, in addition, can now be found in the English Market. Called there today and bought some smoked mackerel, one dressed with a chilli flavour, the other with Piri Piri. Used them with beetroot in a starter. Lovely. The Good Food Shop in the English Market has a huge stock but I was on the hunt for one of the first batches of Ummera Smoked Duck, recently trialled at various food events. Didn’t really expect it to be available as the producers hadn’t flagged its availability in the city on their site or on twitter. But lo and behold. There were two little packages at €5.99 each. Grabbed them quickly. The helpful lady at the till had been previously mightily impressed by Ummera’s smoked chicken and salmon but was wondering about the duck. Assured her it was absolutely gorgeous and it is! You could miss the chocolate shop in the English Market but once you find it you will never miss it again. It is a small packed treasure trove of all things chocolate, a must see destination for choc lovers. Picked up some truffles there today: Baileys and Amaretto, 60 cent a piece. Gorgeous. I loved both, but I have to say the Baileys was the favourite in this house. Sheehan Butchers have made considerable improvements to their St Luke’s shop in recent years. With huge new cold counters installed, it is now big and bright and the friendly service is as good as ever. You can get all your meat requirements here. The meats are sourced locally. It doesn’t stop at meat – it is also a very good stop for other related items, including things like marinated pork products, meat balls, chicken and beef on skewers and so on. They also sell potatoes and watch out for the excellent rashers (packed by Ballincollig Bacon Slicers). Keep, an eye also for special promotions. On my very recent visit, they had 25 per cent off the price of everything. Great value. The Long Valley is a longish narrow pub with a shortish very narrow toilet (gents, haven’t seen the ladies loo!). They say they make the best sandwiches in the world but it was little too early for lunch when I called for a cup of coffee. Got it straight away from the friendly lady and it cost a saucy enough €2.30 considering that it was just an ordinary coffee and that , a few yards away, the Old Oak will give you an ordinary coffee and a scone for 2 euro. Still there was nothing wrong with it and I enjoyed it as I have enjoyed a few pints there over the years, though this fairly basic establishment is not everyone's cup of tea. Especially those who like their comfort! But it is central. Silversprings Hotel is full of surprises. It is a fine hotel with all the usual facilities. Great place for large groups, such as dinner dances and weddings. I’ve enjoyed a few there. The restaurant is not bad either and they have an early bird (€19.95 for 2 courses) on at the moment. My latest visit to the Eoin Daly managed venue came last night to take part in the Raising Cork Quiz, the hastily but so well organised quiz in aid of the local flood victims. TV and Radio personality George Hook put in a stamina sapping shift and still had enough steam left to snap the final tie with the wisdom and incisiveness of a Pattwell! It was quite a success, prizes galore, and some €25,000 was raised on the night to be distributed by St Vincent de Paul. Take a bow – all two hundred tables – and especially organisers H&A Marketing who put the impressive show on the road in less than ten days. Gubbeen farmhouse cheese is one of the best known in Ireland and marketed internationally by the small family company from West Cork. Picked some up recently at the Farmers Market in Mahon Point and it is really really good, up there with the best of them. They also do a smoked version and, more recently, have produced other smoked items such as rashers, sausages and salami. Will be calling again! Enter your team at above link. Enjoyed an excellent “Early Dinner” at Fenns Quay Friday night. They live up to their “simple philosophy”: use only the best produce from the best local suppliers and treat it with care and attention to detail. The attention starts the moment you walk in as the service is friendly, professional and discreet. The early dinner offer is a 3 course meal for €27.50. Started with a tasty tomato and brie pot. Mains was venison in a terrific sauce with vegetables, almost like a stew, and we finished off with a melt in the mouth lemon pot with caramelised pears, accompanied by a blackberry sorbet. Fenns Quay has a good wine list, quite a few by the glass, and we really enjoyed the Spanish Bodegas Castano Monastrell 2007. Aside from the Early Dinner menu, you can also go a la carte and both menus are supplemented by regular specials, all very tempting! For the season thats in it, there is also a Christmas menu. Fitzgerald’s Park may be soggy and the Cork City Museum may be closed but the floods haven’t beaten the Riverview cafe and it is open for business. Had a stroll though the park this morning and called in for coffee and a scone, cost €4.30. Not the cheapest. But service and quality was good in the uncrowded venue. It was getting busier as I left. In busy times, you have the opportunity of ordering online (orders@riverviewcafe.ie) or by phone. Tesco at Mahon Point is one of the biggest supermarkets in the county. Aside from the clothing and electrical departments, the choice in food is staggering. Take Balsamic Vinegar for instance; prices here ranged from one euro to close to twelve for aged varieties. Range of wine too is impressive. Got a couple of bottles, including a Tarrango by Brown Brothers for old time’s sake. This unusual variety, which I first came across a few years ago when the brothers (sisters actually) came to town to show off their produce. It is a red that may be chilled. Liked it then and no reason why I shouldn't like it now, especially that the price has been cut. The first thing that always strikes me in the Mahon Point farmer’s market, at least if I come to it via the shopping complex, is the queue at O’Driscoll’s Fresh Fish (who today had four on duty, two filleting like mad). The Schull based outfit seem to thrive while nearby Ballycotton Fish, offering the same fish at the same prices, seem to be much quieter. Location! Location! They sell the fish by the bag, fiver for a bag of whiting, a fiver also for a big bag of hake or haddock. Looks good value but I’d prefer price per kilo written up. Got some hake and John Dory. Next time though, I’ll weigh up the queue, maybe head for the rivals. Time is precious. 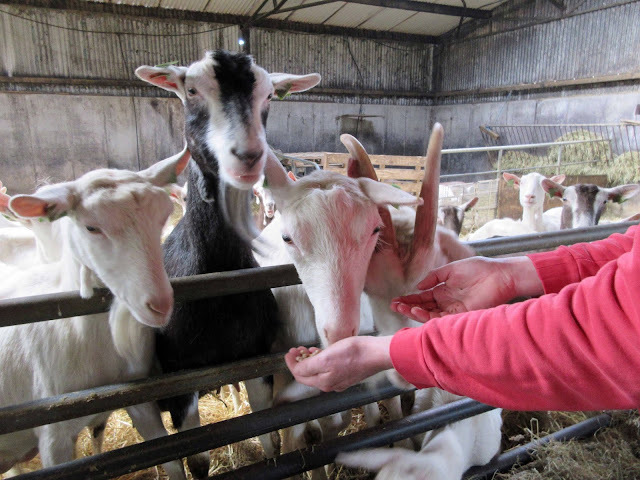 The Magpie Cottage Dairy runs a little goat’s cheese products stall at the Mahon Point Farmers Market each Thursday (10.00am to 3.00pm). Magpie has two main items, each in a jar. One is a herby cheese in balls in sunflower oil and the other is the cheese with the addition of sundried tomato. The jars are dated and the product will keep well, even after opening. Having previously sampled the Tomato version, we picked the plainer jar this time and may well indeed follow the recipe we heard from the man in the stall: put some cheese into your chicken breast, wrap it up with Parma ham or similar and you’re on your way to a lovely dish. Had a ball at a birthday party in the harbourside Rising Tide at the weekend and all ten in the party agreed. Great staff, courtesy and good humour very evident; they even volunteered to take group photos, all very much appreciated. Food wasn't half bad either. Decent selection of mains from about €15.00 to mid 20s. All excellent as were starters and desserts. House wines started from 20 euro and were fit for purpose. Very enjoyable overall and would recommend the Glounthaune venue. Watch out for their Christmas parties at €40.00 – should be well worth it. Recent customer Lady Gaga enjoyed her visit here! O’Connell’s Fish stall is by far the biggest of the (too few) fish outlets in Cork’s English Market, supplementing their extensive stock of fresh fish (usually brought up from Castletownbeare that morning) with quite a few fish products such as kippers and continental style fish soup. Service is efficient and friendly and the staff are always ready for a bit of banter. Got some salmon and sea-bass there today from the well iced counter. Fish is quite expensive in the market and I often wish for more competition. The newly completed Boardwalk at the South Mall end of the Grand Parade is not the biggest in the world but it has its uses. If the day is fine, you can sit down and have a drink or snack, and enjoy the views. To the left you look down the south channel of the River Lee towards the Holy Trinity Church. In front, you may watch the world go by over the pedestrian bridge and to the right, you have a fine view of the South Gate Bridge with St Fin Barre's Cathedral looming over it. The coffee dock is yet to open but that will add to the facility and enhance your break from work, shopping or sightseeing. The Barn is one of the old reliables in Cork. I went there the other evening to try out their €25.00 early bird menu. The Egg Mimosa (with garden salad and balsamic vinegar) looked the most exciting of the four starters (plus soup) available but I enjoyed my Salmon Fish Cake and the Classic Duck and Chicken Liver Pate also went down well. The old reliables were wheeled out for the main course. You could choose from Pork Steak, Sirloin (3 euro extra), Salmon and Chicken, also a Beef Pie. They came as ordered. My steak was perfectly cooked and the Salmon with veg and a warm potato salad was “absolutely beautiful”. The Beef Pie was quite substantial. Three desserts were served at the table – they don’t bring their famous trolley to the Early Birds! All three were fine. I really enjoyed my Mango Cheesecake, the Rich Chocolate Cake was seen off but perhaps the best of the three was the Pavlova (the real thing) with fresh fruit and Crème Anglaise. There is a high standard of friendly service here and, with the restaurant less than quarter full (On a Thursday night), we were well catered for but in an unobtrusive way, with an adequate two queries during the meal (is everything okay?). Wine prices have dropped to the Early Bird level and we enjoyed an easy drinking Shiraz from OZ (GB 56 2007) for €20.00. The spacious Barn is very comfortable – some find it a little old fashioned but it had many devotees. And the smokers among the regulars will be glad to see that a new “smoking room” is nearing completion. Cork’s Grade Parade is the venue for the city’s Christmas market over the next three weekends. It opened with a fanfare last Friday, coinciding with the switching on of the Christmas lights. The highlight here is a so called winter garden, designed by the well known wedding designer Franc who has transformed Bishops Lucey Park into something of a wonderland, open only between 5.00 and 8.00pm Fri-Sun. The trees are lit up and here and there are groups of reindeers drawing sleighs of light, illuminated “gazebos” where young and old (there is mistletoe hanging there) can have photos taken; here too the kiddies can take a ride on a carnival roundabout and leave a letter for Santa. The market “showcases the best of local food and crafts” – how Chinese made trinkets fall into the category is beyond me - in some fifty stalls stretching from the park to the river. So off you go. Maybe you’ll solve your present problems. At the very least, enjoy the music and the magic in the subdued lighting of the park. And mind that mistletoe! Mrs Santa could be waiting for you.